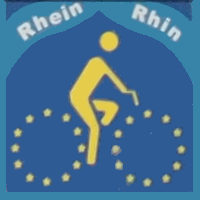 If we consider Europe at an overview level, according to EuroVelo, there would seem to exist a Rhine bike route (Rhein-Radweg), numbered as EuroVelo 15 and which even has a dedicated webpage, on which two routes are described, one that follows along the right bank of the Rhine, the other along the left bank. In reality, though, there isn’t a true bike route that has been signed with any consistency and that really follows the river for its entire length, such as the Donauradweg along the Danube or the Elberadweg, along the Elbe. Instead, one can travel along the Rhine using local bike route segments and low traffic streets and roads; but there is no official bike route signage along this route, neither in Germany, nor in Holland. Only occasionally did I see the square blue symbol shown at the upper right. That left me with two options of how to navigate along the Rhine: 1) use the Esterbauer Rhein-Radweg guides, in four volumes, from the source of the Rhine to the Rhine delta at Hoek van Holland, which would also allow using GPS traces from GPX Esterbauer; or 2) use the cycling navigation mode from Garmin to find acceptable routes between any two segments of the overall route. The first method (using the Esterbauer guide) would allow me to visit all the interesting places along the Rhine and to keep the furthest distance from the highways; but that route is rather circuitous, especially in Dutch territory, and it would almost double the distance, and based on the number of miles per day, it would make the trip itself take substantially longer. The second method (Garmin) would allow a substantial reduction in distance and time and would even avoid dead time required to consult guides and maps, but the route would follow along busier roads and in some cases direct the cyclist onto outright unpleasant roads, or perhaps onto roads with bad pavement and barely ridable, or even more extreme, along bike lanes next to very busy roadways, or at worst, along busy roads without as much as a bike lane. So for this trip of 2017, in which I wanted to follow the Rhine almost to its end (to Rotterdam, for me) and then take a side trip into Belgium, I started by applying the first strategy; then as I lost time primarily from rain and heavy winds, causing me to arrive at my destinations in the evening, I switched to the second strategy; time and distance were reduced drastically, I would arrive in early afternoon with the option to explore a little more before arriving at my destination city. But the tradeoff was the route along the way was less interesting. In the table to the side are the eight segments that I covered in August 2017, with a link to each page provided with photos and altimetry. Rhein-Radweg 4 - Niederrhein · Von Köln nach Hoek van Holland (from Cologne to the Hoek van Holland) the best guide from the renown Esterbauer series. ADFC-Radtourenkartenthe best maps from the Allgemeiner Deutscher Fahrrad-Club (German Cyclist’s Association) edited by BVA; for this route I used map numbers 10 and 15.